I love popcorn. It is my go-to snack. I wanted to create a easy treat that would feel special but nutritious for snacking, and I knew it would include popcorn! The party included decorating a small World Market popcorn box and filling it with goodies! So when I heard about this fun party, I signed myself right up! I received a small box loaded with fun items from Udder Smooth hand cream, Laura Kelly for AdornIt, World Market, Kunin Group Felt Dream Team, Exp International (that's where my pom trim is from!) 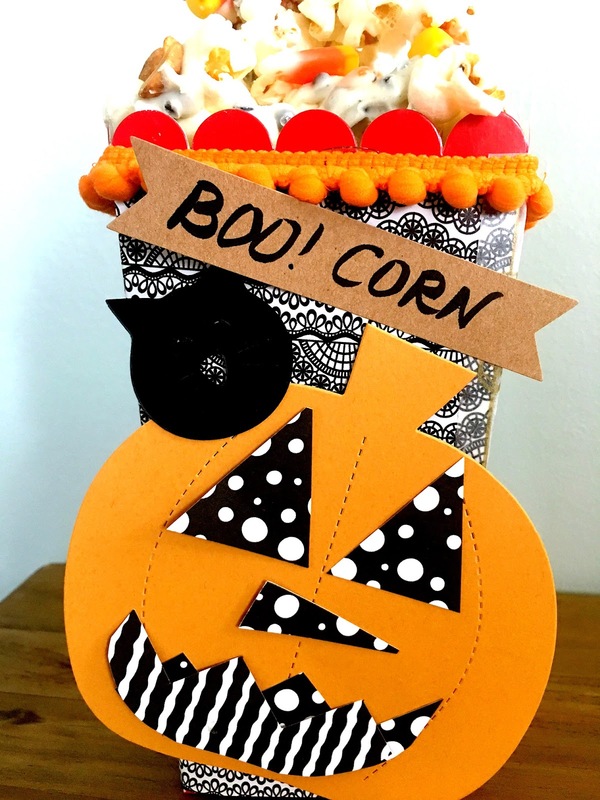 I loved using the papers from AdornIt to create my fun box! I can't wait to see what the others come up with! Inside that adorable popcorn box from World Market is my Boo! Corn. Boo! Corn is so easy to make, you really don't need a recipe, just directions! Place a sheet of parchment paper on top of a cookie sheet. Spread the popcorn over the parchment. Melt kisses in a bowl in a microwave, starting at 30 seconds. Stir after each 30 second time. When melted, drizzle the white chocolate over the popcorn. Immediately sprinkle the candy corn and peanuts over the hot candy and popcorn. Let come to room temperature. Break up pieces before serving. Before you leave, enter our giveaway below and check out all the other popcorn boxes created by our friends! cute result. Fellow Popcorn Box crafter visiting from Try it - Like it. I love popcorn and I love it even more when combining it with a sweet treat like chocolate or other candy. The combination of salty and sweet with a little crunch is so delicious and satisfying. This is simply adorable! I love visiting World Market whenever I'm Louisville, Kentucky, so I'll definitely be entering this giveaway. Thanks for the opportunity! What a fun idea for a party! I love the way that they all turned out. So super cute! Love the decorating. I just love popcorn, I will def. try this tasty treat. This is awesome, I love all the different ideas and creativity from everyone, would definitely make Halloween extra spooktacular! 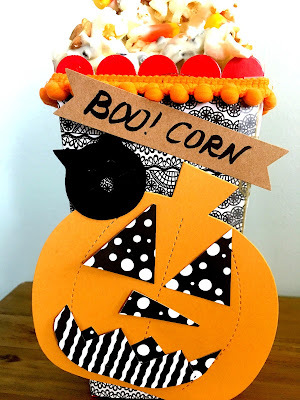 This would make a cute hostess gift for a Halloween party! I'm doing a lot of Halloween crafts before the new baby comes because I won't have much time. Who doesn't love popcorn? YUM this sounds like a super delicious treat!! What a fun idea for Halloween! This is too cute! this is the first time to your blog but i think I jumped so many posts and forgot to comment! I love your blog keep it up! oh yum! what a yummy Halloween treat! I know my daughter would be excited to make this! Thanks! Super cute, and the recipe sounds great! That's a lovely arrangement and it's also something that both the adults and kids will love. I like that it's not that difficult to put together as well. This is such a cute little craft! It would be great as kind of a party favor box for a halloween party. I've seen so many cute crafts using popcorn boxes lately. I love the little box that it is in. It really gets me into the Halloween spirit. I also love popcorn, so I would love the Boo! Corn too! I saw this post last time and could of sworn i commented haha! I loved this idea and have gone through a few posts below! this is super cute! Oh yum. This sounds wonderful. I love popcorn in general so jazzing it up with chocolate sounds amazing. Cute box. Oh my goodness - soooo cute! Love this idea. Thanks for the recipe! This is great! I'm always looking for ways to make snacks special, as they can get boring from time to time. This would be a great treat for a halloween party! Such an adorable idea! This would be a fun party! Kids will surely love it. Awww, this is a really cool idea. 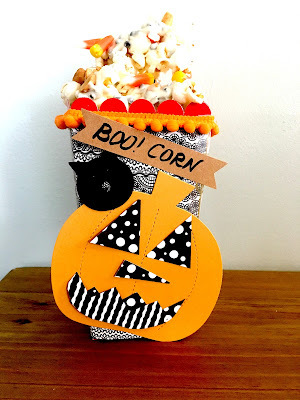 I really like the way you rethought popcorn and made it completely perfect for Halloween. Thanks for sharing! Front Porch is Halloween Ready!